Chris earned a day off because the dentists got the soldiers to 65% readiness Class I (gotta love Army jargon) so we decided to take off the 31st and take a trip to Görlitz, Zgorzelec, Dresden, and the Bastei Bridge. 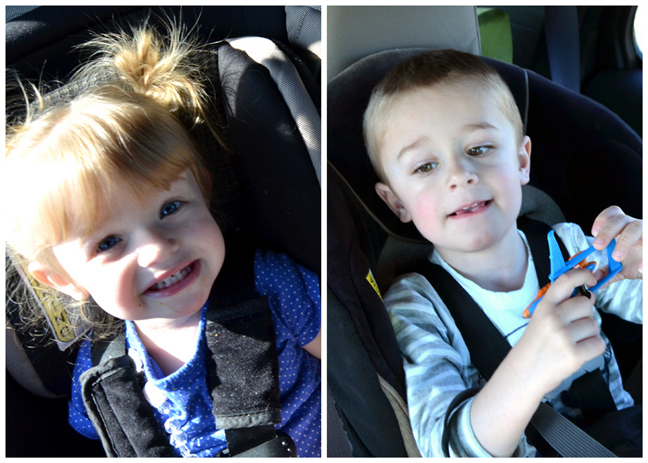 We packed a lot of fun into three days! We left Saturday morning. It was a beautiful day. Rolling hills and cute German towns as far as the eye can see. Jane's a happy camper. Fox just being Fox, always playing with a toy. About 2.5 hours into the 3 hour and 45 minute drive Fox had one of his exorcism tantrums - he does this thing in his carseat where he says he's too hot and wants to get out, but obviously when we're driving on the no-speed-limit-autobahn (or anywhere ever really) we're not going to let him out of his carseat. He wails and gnashes his teeth and it sounds like demons have taken over him. Hence, exorcism tantrum. We had to pull over and give him a stern talking to. The rest of the drive was smooth. When we pulled off at our exit we saw the golden arches and stopped for some lunch. 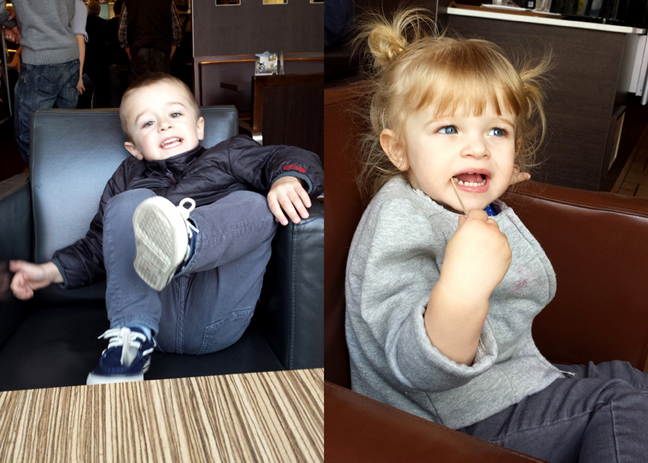 Fox and Jane loved sitting in the modern "McCafe" chairs. 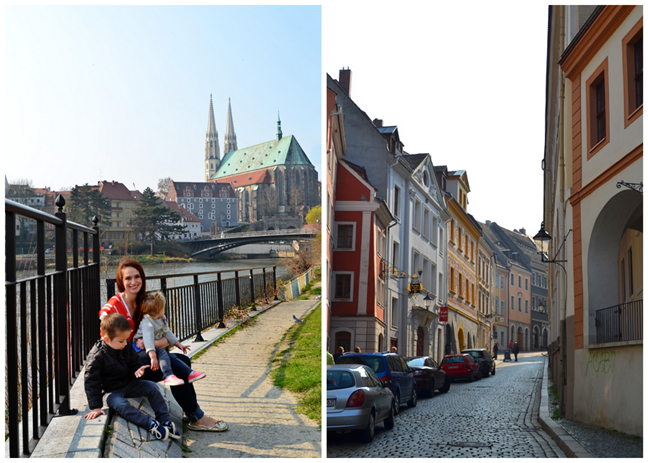 We made it to Görlitz (pronounced GUR-lits), Germany, found a place to park, and started off on the Rick Steves self-guided walking tour - our favorite thing to do! 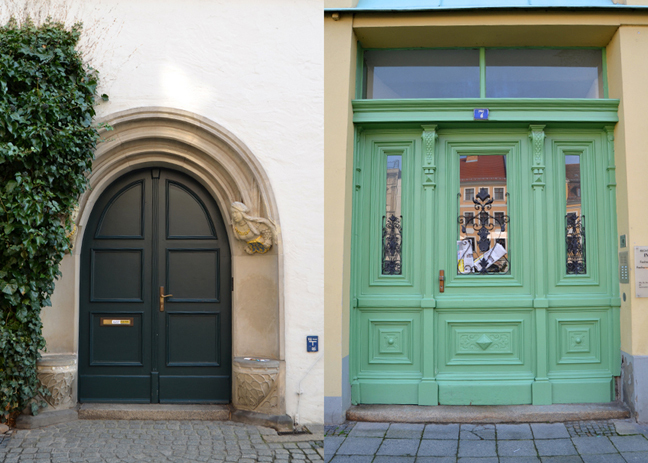 A bit about Görlitz - tucked away in Germany's easternmost corner, the surprisingly beautiful town of Görlitz is a treasure trove of architecture and one of this country's best-kept secrets. During the Middle Ages Görlitz prospered from trade in cloth and beer. The Old Town was built up as the centuries passed, leaving it a delightful collage of architectural styles. Although no bombs fell on Görlitz itself during WWII (only on its bridge) the city has experienced its share of destruction, from the Thirty Years' War to the ravages of three great city fires. 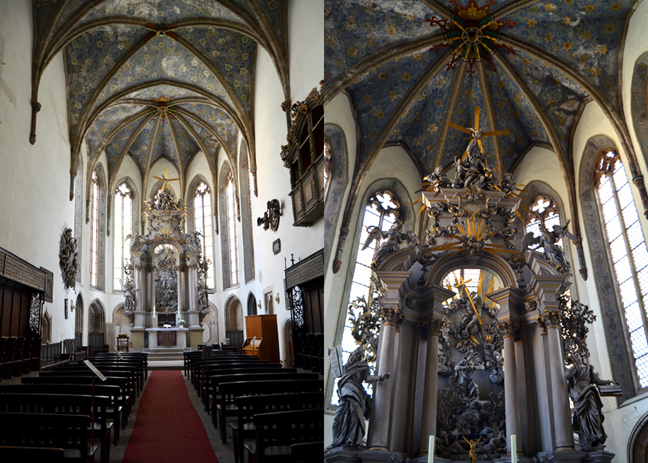 Each wave of devastation allowed Görlitz to rebuild in the architectural style of the time. The results are an astonishing collection of exemplary buildings from every era: Gothic, Renaissance, Baroque, Gründerzeit (late 19th century) and Jugendstil (Art Nouveau). In the late 20th century the East German government placed the entire city under a protection order rescuing it from the bleak communist aesthetic of the time. More than 3700 buildings are registered historical monuments. Even now, energetic reconstruction efforts continue partly thanks to the city's secret admirer - every year since 1993 an unnamed benefactor has donated about $665,000 to renovation projects. Nobody knows who this person is and anyone who attempts to find out is dealt a swift warning from a high-priced Munich lawyer. 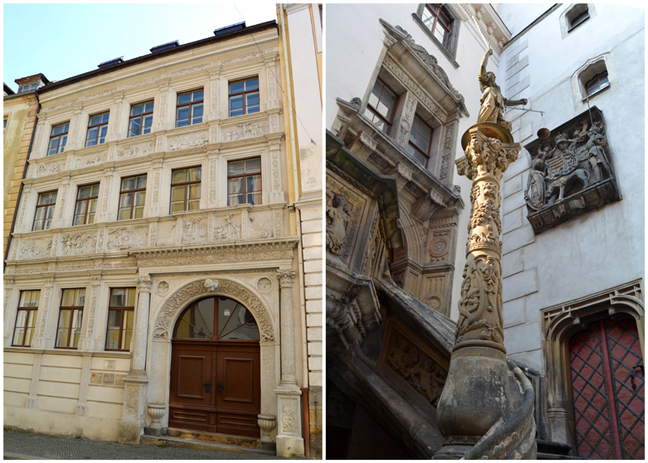 All of these factors have contributed to making Görlitz the gem that it is today. Soon after WWII the town was split in two along the river - with its downtown in Germany but a good chunk of its suburbs in Poland. 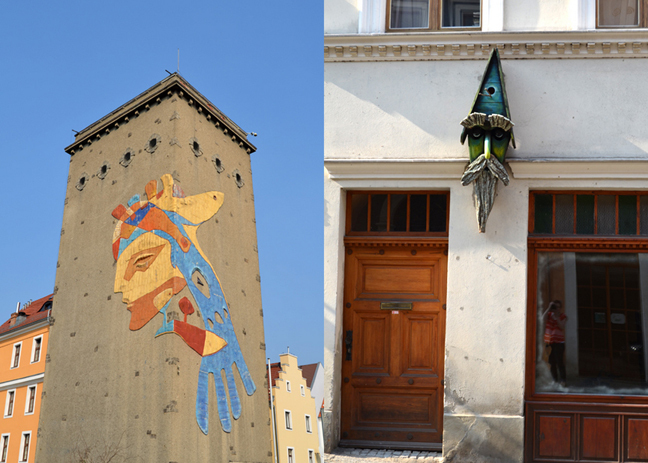 After the Wall fell, Görlitz sprang back to life and polished its gorgeous facades. 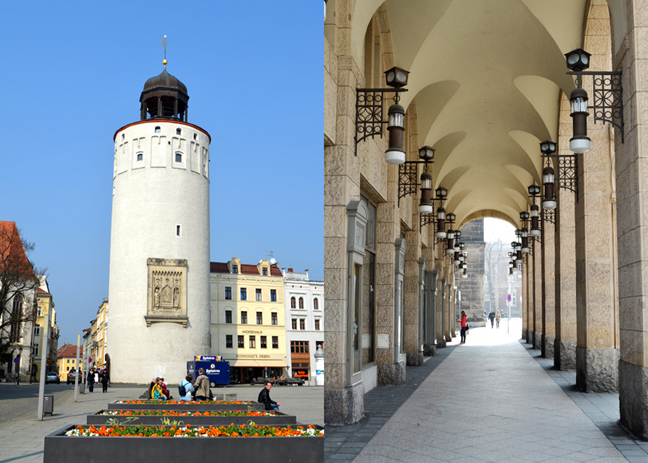 The town offers a unique opportunity to venture to the eastern fringes of Germany, sample Silesian culture and cuisine, and appreciate some fine architecture and a pleasant cityscape. With a population of about 56,000 Görlitz is the largest city in Saxony (there are 16 states in Germany, we live in Bavaria, this is our first venture to a different state - Saxony) east of Dresden, but still small enough to feel sleepy. While a third of the town was given to Poland in 1945 the historic center and most of the sights of interest to travelers remain in Germany. Most sights are in the compact Old Town (Altstadt) stretching roughly between the Marienplatz and the western bank of the Neisee River. In 2004 German Görlitz and Polish Zgorzelec completed the reconstruction of a new pedestrian-only Old Town Bridge across the Neisse. Now that Poland has joined the open-borders Schengen Agreement anyone can freely corss the bridge without having to flash a passport. 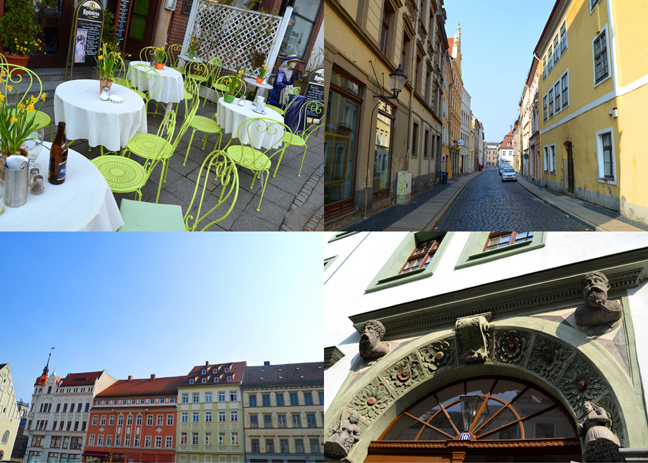 The joy of Görlitz is simply wandering the Old Town while appreciating the architecture and history and poking into shops. Our walk began at Marienplatz. The unique Art Nouveau Hertie department store building (opened in 1913) has a richly decorated facade concealing an ornate glass-domed interior with intricate staircases and galleries. 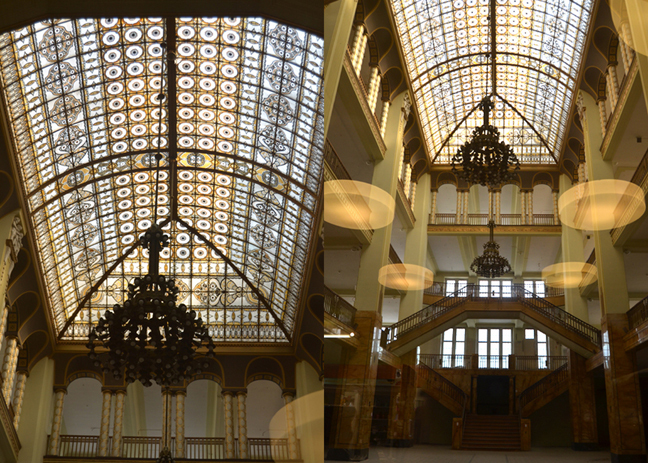 We stepped inside the perfume store that occupies the ground floor and peeked into the luscious building. Next to the Hertie is the Church of Our Lady, a 15th-century late-Gothic church built near the hospital and poorhouse outside the city walls. 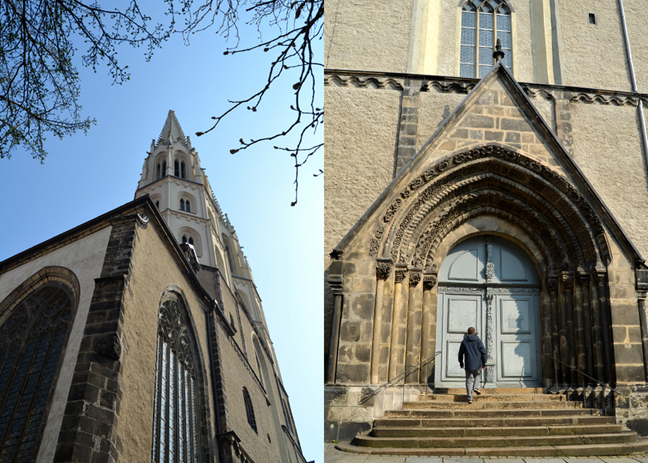 This church served as a forum for discussions and peace prayers in the fall of 1989, shortly before the Berlin Wall came down. A poster announcing the first prayer meeting was placed in the glass cabinets on the front of the church. Soon, like-minded shopkeepers began to follow suit and 580 people attended the first meeting. Just two weeks later 1300 people showed up, and subsequent meetings swelled to 5000 - so large that they spilled over into other churches. The meetings became a forum for discussing impending political changes, civil rights, and environmental issues. As each participant came forward and voice his or her concerns, a candle was blown out until the church was dark. Then, as those who had a hopeful or positive experience came forward, a candle was lit until the church was illuminated once again. Sounds like it would take forever and a day! The East German secret police, the Stasi, stationed plainclothes police in the buildings across the street to document who was participating in these "acts of civil disobedience." Many people lost their jobs or were otherwise punished. But the hope for democracy and self-determination had already caught on, and today, this church stands as a symbol of peace and solidarity. We took a gander inside and enjoyed the refreshing details and stained glass. Even the sewer covers are more ornate in Germany! On the north side of Marienplatz is the Fat Tower, lol. It's the second-oldest tower in the city's defensive network. Although the tower is Gothic (from 1270) it's topped by a copper Renaissance cupola. It's decorated with a sandstone relief of the Görlitz city coat of arms, featuring a Bohemian lion and a Silesian black eagle - representing Görlitz as an independent and free city. A large gate used to stand next to the tower, but it was torn down in the 1840s. 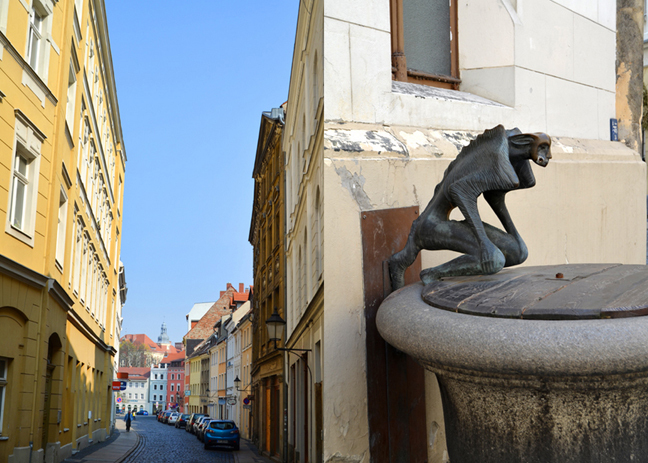 We meandered down Steinstrasse and admired the picturesque alleys and a creepy gargoyle fountain. We popped out into Obermarkt (Upper Market Square). This 13-century square is lined with mainly Baroque houses. 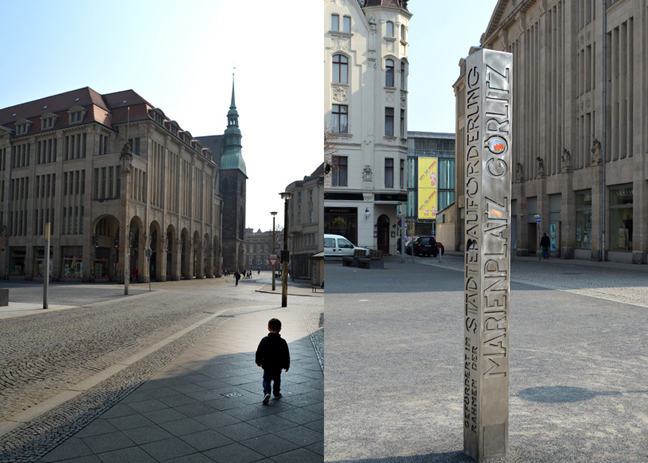 Like many town squares in east-central Europe it's long and skinny with a church at one end. 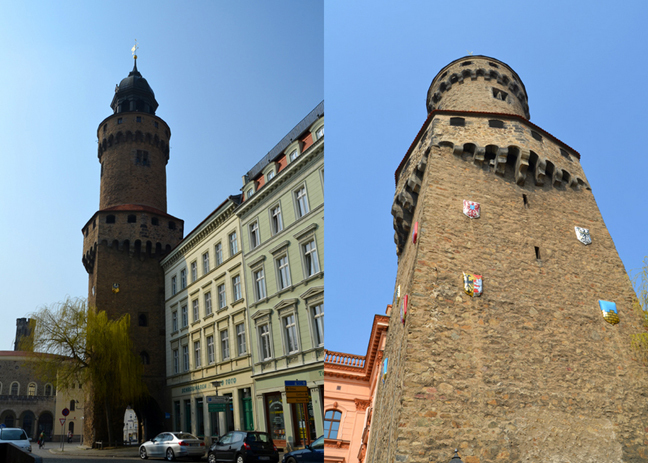 The Reichenbach Tower, dominating the upper end of the square, formed part of the western city wall and dates from the 13th century - mighty old. The upper portion was added in 1485 and is topped with a Baroque cupola from 1782. The tower housed city guards and watchmen - who among other things kept a lookout for fires - until the last "tower family" moved out in 1904. Behind the Reichenbach Tower is a circular building called the Emperor's Keep. This bastion was built in 1490 as part of an effort to strengthen the city fortifications. After the Thirty Years' War when the Swedish troops made their last stand against the imperial Saxon army, this has been used as an archive and houses the Cultural History Museum where exhibits run from the Ice Age all the way up to the fall of the Berlin Wall and DDR. We leisurely walked down to the other end of the Obermarkt and enjoyed the quaint sights. At archway #27 is the Traitor's Passage, a dark, sinister alley used by the instigators of the rebellion to sneak in and out of the main marketplace. Halfway down Traitor's Passage the letters DVRT and 1527 are carved into the stone next to a gate. This was where the traitors met and stored their weapons. "DVRT" stands for "die verräterische Rotte Tor," or "The Gate of the Traitorous Gang" - it's a warning. Fun doors. At the other end of Obermarkt is the Church of the Trinity. The tower is unusually thin and doesn't keep very good time thanks to one in a series of Cloth-Maker Rebellions: in the Middle Ages, Görlitz was run by the powerful guilds of the cloth trade and the brewers, who neglected the rights of their workers and forbade nonmembers from practicing their trades. Finally, in the early 16th century, the workers rose up against the corrupt city council, which allowed the guilds to continue their unfair practices. The rebels ended their meetings punctually at midnight to avoid the night watchmen who would be on the other side of town at that hour. But the city council was one step ahead - they ordered the church bell to chime seven minutes before midnight to fool the conspirators out onto the street and into the waiting arms of the guard. Fourteen of the conspirators were executed and 25 more banished from the city. The bell still chimes seven minutes early. In 1245 Franciscan monks consecrated this church. 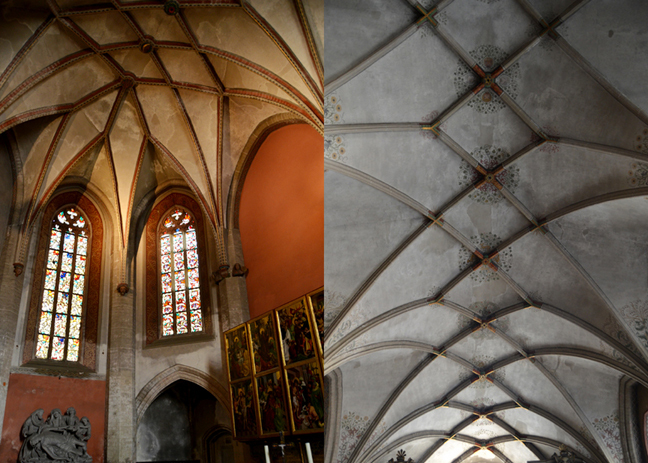 Although originally a Romanesque structure, renovations in 1380 gave the church its current late-Gothic appearance. When the Reformation took hold in Silesia in 1563, the monks surrendered the keys to the church and monastery - with the condition that the monastery be used as a school. A school operates in the former monastery to this day. The interior seems austere but reveals delightful little details. Pillars from the original 13th-century Romanesque chapel are integrated into the walls. The high altar was built by artists brought from Dresden and it resembles the crown gate of the Zwinger (which we saw the next day). 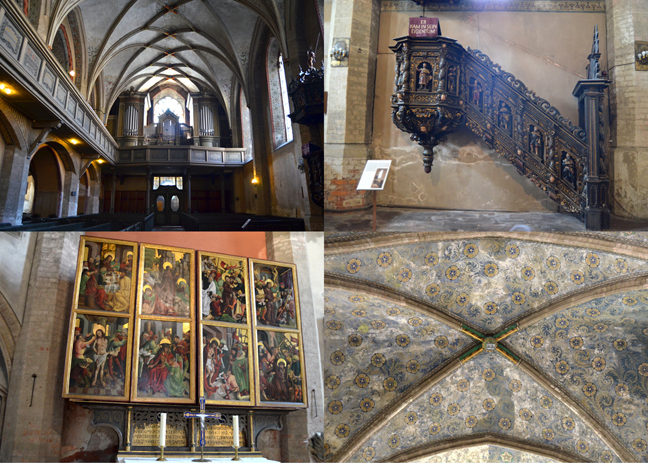 The missing crucifix on the left wall (now in Warsaw) is a reminder of the artifacts that were pillaged from this church during various wars, but the choir stalls, carved in the 1430s, are original. The church's trophy is in the back chapel: the Marienaltar, a beautiful 15th-century carved triptych. It's three works of art in one. Supposedly it's usually open but today it was closed. Still, so beautiful to behold. Gorgeous stained glass windows. And An exhausted Jesus, reminiscent of Augusted Rodin's Thinker, ponders the state of man. This painted wooden statue, from 1920, used ti sit on the grass outside of the Holy Seulcher - the base it rotted from being subject to the weather and elements for so long. Horse-drawn carriage just waiting to carry people around town. We walked along Brüderstrasse - the street that connects Obermarkt and Untermarkt (over and under - see, you're learning German!). We stopped for a scoop of ice cream - or "ice screen" as Fox calls it. This orange and gray house claims to be Germany's oldest Renaissance civic building (from 1526) and now houses the Silesian Museum of Görlitz. On the upper side of the square is the tall Gothic tower of the Town Hall (Rathaus). 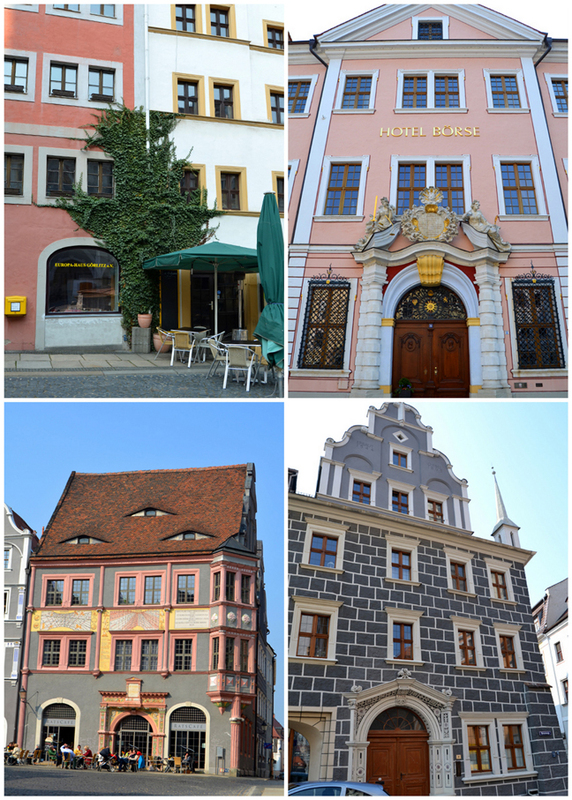 Görlitz had no town hall until 1350 when the city purchased this building from a prominent citizen. The tower was extended to 195 feet in 1368. 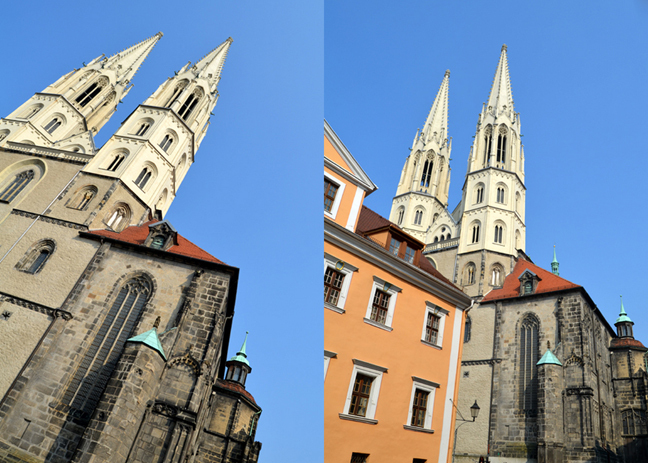 A lightning strike blew the top off the tower in 1742 prompting the addition of the current Baroque turret. The tower houses two clocks: the upper clock measures the day, month, and phase of the moon, while the lower clock tells the time. The date inscribed on the clock, 1584, commemorates the year when Bartholomäus Sculteus, an astronomer and mathematician, first divided the clock into 12 points. Sculteus also helped develop the Gregorian calendar. 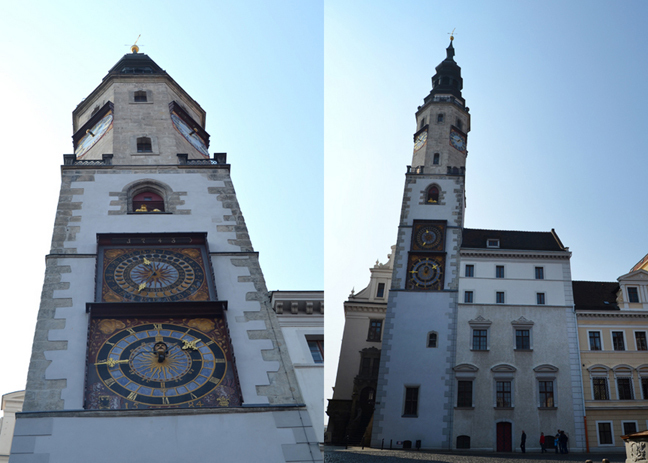 The city honored Sculteus, a Görlitz native, by being the first city in Germany to adopt both the new calendar and the clock. The Town Hall upstairs represent the height of Görlitz Renaissance sculpture and lead from the street level to the buildings then-main entrance. Local officials used the balcony to make public announcements and decrees. The Untermarkt square (which doesn't fully feel like a square because of the buildings in the center) shows just how prosperous the cloth trade made Görlitz. 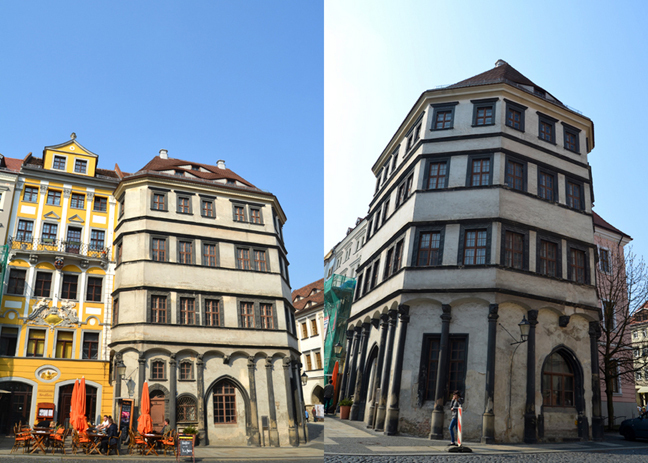 This building (part of the buildings in the center of the square) housed the city scales - it was one of the most important commercial buildings because, at its peak, more than 1000 wagons PER DAY entered Görlitz. Everything had to be weighed and duties paid here. More fine-looking buildings in Untermarkt. Down Neisstrasse at #29 is the Biblical House. As the Catholic Church had banned religious depictions on secular buildings, the carvings on the Biblical House made it clear that the Reformation was here to stay. The houses in the Neissstrasse had all burned to the ground in 1526. Hanz Heinz, a cloth trader, purchased this house and rebuilt it complete in the Renaissance style. The house is named after the sandstone reliefs decorating the facade between the first and second floor parapets. The top level represents the New Testament. The bottom row depicts the creation of Eve, the Fall of Man, Isaac's sacrifice, Moses receiving the Ten Commandants, and Moses banishing serpents. | The statue of Justice (1591) - she's not blindfolded - in other words, the city is the highest authority. We backtracked just a bit down Peterstrasse. These buildings had painted details on them. So interesting! At the end of Peterstrasse we turned left and walked to the Nikolaiturm - the oldest of Görlitz's towers, which marks the site of the original village of Gorelec. 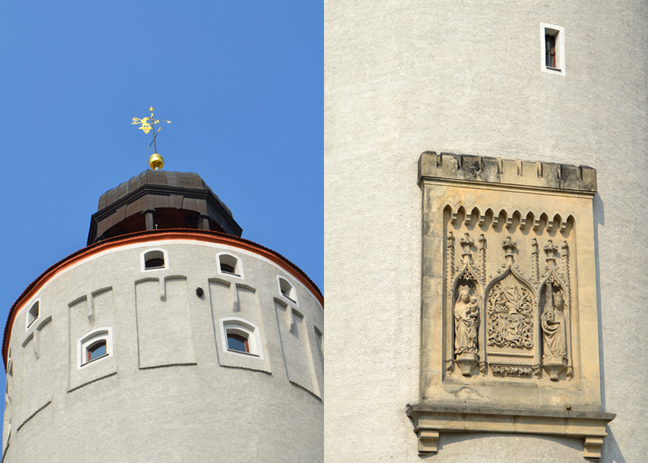 The Nikolaiturm, like all of the city-wall towers, got a facelift in the 18th century that replaced its pointy top with its current round dome. The city walls and gates were destroyed in 1848 and the stones were used to build the Jägerkaserne - a barracks off in the distance to the left of the Nikolaiturm. The only remaining section of the city wall is now a pleasant park that curves around from the base of the Nikolaiturm to the back of the Church of St. Peter. We back to Peterstrasse and turned right to reach the Church of St. Peter. 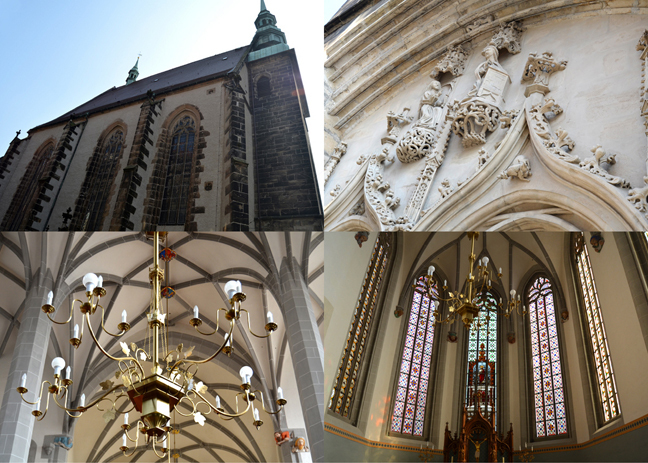 The church was completed - after many setbacks, landslides, and Hussite invasions - in 1457 and renovated in restrained Baroque style after fire destroyed the interior in 1691. The spires were added in 1890. The doors were closed, sad. But the exterior is beautiful. A plaque on the Church of St. Peter. We rounded the corner behind the church and got our first glimpse of Zgorzelec Poland! My favorite thing is impressive views. This one did not disappoint! We crossed the pedestrian only bridge. Fox and Jane, always getting into mischief, trying to climb over the sides of the bridge. When everything east of the Neisse River (and, farther north, the Oder River) became a part of Poland, Görlitz lost its eastern hub. By 1946 Poles transplanted from Belarus and Ukraine eliminated all traces of German past and created the city of Zgorzelec. On both sides of the river, government and citizenry are making great strides to glue the city back together (at least culturally) in a united Europe. Brand new, not even in use yet, buildings in Zgorzelec. I went to Poland a couple months ago with some girlies to hunt down Polish pottery, but this was Chris's first time into Poland! Chalk another one up! 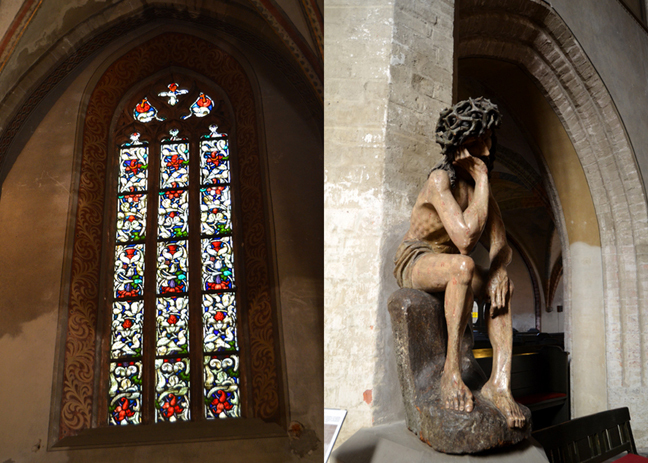 Looking back at Görlitz and the iconic Church of St. Peter. 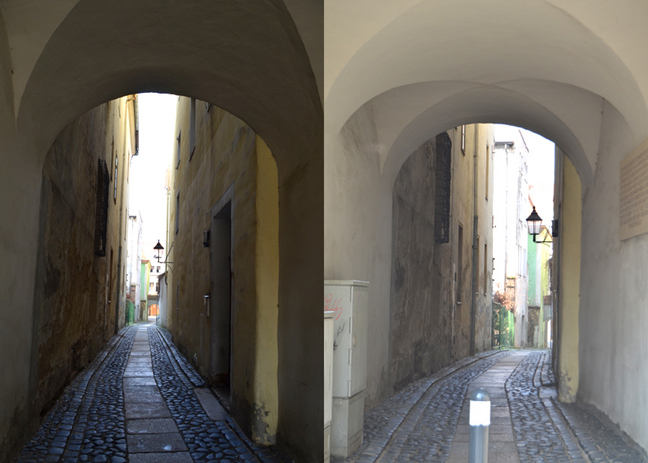 It was definitely a stark contrast walking the streets of Zgorzelec compared to the wonderfully restored Görlitz. All in good time, all in good time. 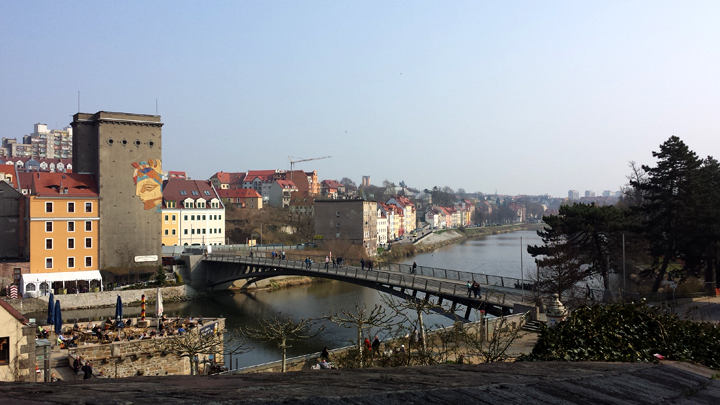 We chased some pigeons and jumped off angled curbs then made our way back into Görlitz, stopping for a minute to gander at people eating their lunch on this open terrace perched over the river. The sun was setting and made for a perfect ending to a great day exploring the fascinating cities of Görlitz, Germany and Zgorzelec, Poland! We made it back to the car and then drove to Dresden - recap coming next! Great recap! 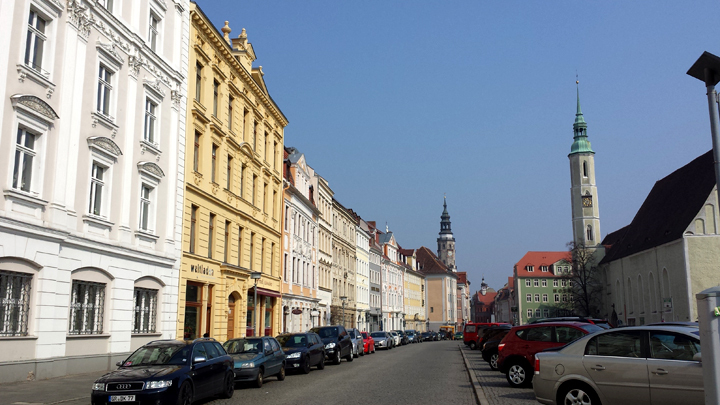 Goerlitz was a fun town. I can't wait to read the Dresden and Bastei posts! How fun (wellllll except for maybe Fox's exorcism tantrum! LOL!! My son used to have those too!!) ... and the pic to the upper left of this sentence "These buildings had painted details on them. So interesting!" ... I totally thought it looked like eye slits on the roof!! YIKES!! LOL!!!! WOW! What an amazing adventure! I liked the photo of the new buildings in Poland--and every single other photo as well, of course.